What is the RealSupport Website Design and Website Maintenance Service? Website Development & Design includes the creation of a completely new website, or the re-design of an existing website. RealSupport offers full-service, custom website development from concept, to design, to content. 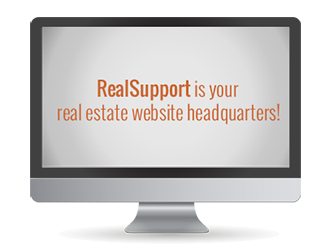 Whether you want to make a wholesale change to your real estate website, or just update a few areas, we can help! Website Maintenance Service includes handling the operation and updates for your template websites, such as RealPro, Point2, Superlative and GoDaddy. We take care of security upgrades, site optimization, and content updates. Your real estate website is your “first impression” to new prospects. A professional website with robust content provides value to your clients, generates new leads, and promotes your brand. It also provides you with essential search engine recognition. Your real estate website is the hub of your online presence and the foundation of your online reputation! Real Estate Websites made easy! E-Z Budgeting: We offer package pricing, monthly billing and seamless service. Contact us today for your personal website consultation!